I've sensed you ever since I came to this world. You're like me. You bleed new energy. So does that. This bident-like spear consists of a bone shaft over 4 feet long and a two-pronged tip consisting of what appears to be sharpened stone. According to the archangel Michael, the weapon "bleeds new energy" in this universe, and has the ability to injure the archangel, leaving a scar on his vessel, Dean Winchester. The Winchesters believe it to be the only known weapon that can kill Michael. Patience Turner gets a vision of the spear. She sees it flying into someone's chest and a brief vision of Jody. 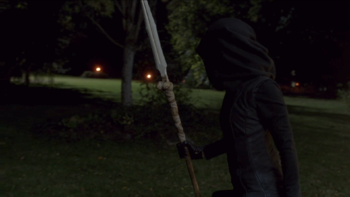 While Jack and Kaia are attempting to open a rift to Apocalypse World, a hooded figure can be seen running around the forest carrying the spear. Patience explains her vision of Claire's death to her and Jody; Patience sees the spear followed by a vision of Jody holding Claire. While Sam and Dean are trapped in the Bad Place, a hooded figure follows them around. Later, she subdues them with her spear and takes them back to her camp where she ties them to tree stumps and bangs a giant skull with her spear. It attracts the attention of the Kaiju who follows the sound. Later, when Claire and Kaia find Sam and Dean and lead them to the rift, the hooded figure arrives and flings her weapon at Claire, but Kaia pushes her out of the way and takes the hit. Sam, Dean, and Claire pass through the rift right before it closes. Somewhere in Sioux Falls, the hooded figure appears through another rift with her spear. She takes off her hood and reveals Kaia's face. After returning to the Bunker, Dean finds two scars on his right shoulder. He gets Castiel to dig into his mind to try and remember what happened while he was possessed by Michael. He sees a vision of Dark Kaia stabbing Michael with her spear. They call Jody, who recognizes that the mark was seen in three other decapitated victims. Later, the trio look around the forest and find the place where Dark Kaia camped out. Dean inspects the fire and gets a brief vision of Dark Kaia wielding her spear. Suddenly, the real Dark Kaia appears and attacks the trio. They are all surprised when they see Kaia's face. She is eventually able to escape with her spear. Dean tracks her to an abandoned cabin and knocks her out. She explains that she's not the same Kaia they knew, but her double from the Bad Place. Jody asks why she killed Kaia, but Dark Kaia claims that it was an accident and that she was actually trying to kill Claire. Dean tries to coax the spear's location out of her, but she taunts him about being weak and afraid of Michael in response and refuses to talk. She tells them about how Michael visited her in the forest while he was possessing Dean. He tracked her location as both her and the spear "bleed new energy." He offered her a place by her side in exchange for the spear; if she refused to join him, he promised he would kill her and take the spear anyway. They battled and Dark Kaia was able to subdue Michael and stab his shoulder with her spear. They realize that Michael wants the spear because it has the power to hurt archangels, hence his sending monsters after Dark Kaia. Three of Michael's vampires track Dark Kaia down to the cabin and battle the trio. Dean shoots the chair to free Dark Kaia from her restraints, but she jumps out of a window and flees. She quickly returns and impales the head of a monster with her spear. She then swiftly kills the other two. Sam tells her that Michael will never stop hunting her as long as she has that spear, but Dark Kaia brushes off his words and leaves, taking her spear with her. After tracking Dark Kaia to a recycling facility in Omaha, Nebraska, Dean is able to convince her to lend him the spear in exchange for promising to have Jack send her back to the Bad Place, where she longs to return due to seeing very little difference between their worlds. Dean and Castiel meet up with Sam and Jack (and an unconscious Garth) at Hitomi Plaza in Kansas City, Missouri. After Castiel draws Michael out and is severely beaten, he is dragged into an office. Sam and Jack fail to attack Michael, and as they lay prone on the floor Dean makes his attack. He is similarly bested, until Sam slides the spear back to him, which allows Dean to injure Michael's arm. As Dean advances on Michael, he comes to a sudden stop, and finds himself unable to attack the archangel. 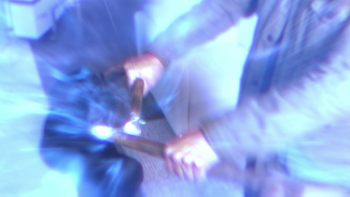 The woman Michael was possessing passes out and Dean is revealed to have been possessed once more after Michael destroys the spear, causing an explosion of energy. In an attempt to keep Michael's Monsters at bay, Jack uses the broken handle of the spear to hold the door shut. This page was last edited on 7 March 2019, at 08:29.